Project obstacles and solutions: In February 2011, Nanshan America Advanced Aluminum Technologies announced plans to build a $100 million aluminum extrusion plant near Lafayette, Indiana. Shiel Sexton served as the general contractor for the 435,000 square foot facility. 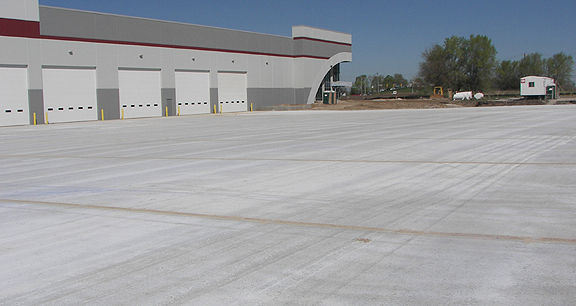 E&B Paving was chosen to pave the parking lot areas with roller compacted concrete (RCC). The parking lot encompassed 425,000 square feet. The parking lot was to be paved in three depths: 6, 7, and 13-1/2 inches. E&B used imix Roller Pave roller compacted concrete for the project. Because of its density, RCC is able to handle heavy machinery and rolling equipment. It can achieve strengths two or three times that of traditional concrete making it extremely durable. It also can be paved in a very short amount of time since it does not use the form and finish method of traditional concrete. The first part of the paving happened in the fall of 2011 and the job was to be completed in the spring of 2012. The Nanshan job was a design and build project. As with any design and build endeavor, tighter specs can be ordered after the project is underway. Prior to the spring pour, IMI QC/QA staff worked with E&B and Shiel Sexton consultants to enhance the mix design and control moisture that is critical for the density of RCC. That included constant testing of raw materials, determining the IMI plant locations that would supply the concrete, and working with E&B on their paving methods. For instance, the 13-1/2 inch depth required a double lift method of paving where one concrete paver is followed with another. Timing is critical. If the second paver is too far behind the initial paving machine, the RCC layers will not bond properly. RCC is a very dry, zero slump product. If moisture varies outside of acceptable tolerances, the concrete could dry out too quickly and the entire project could be in jeopardy. IMI brought a portable concrete mixer into their Lafayette plant to ensure that the supply of concrete kept pace with the paving machines. The team communicated with each other to make sure that concrete was batched and arrived fresh on the job site without any paving stops and starts. Nanshan was so impressed with the spring parking lot paving project, they decided to pave the floor of their building with imix Roller Pave as well. In all, IMI supplied 20,000 yards of imix Roller Pave and E&B paved over 500,000 square feet for the Nanshan project. For more information on imix Roller Pave roller compacted concrete, click here. For information on IMI concrete plants near your area, click here.